After an extended hiatus due to wrist surgery in 2011, Juan Martin Del Potro rejoined the ATP tour by making his maiden appearance in Delray. He went on to capture the title. However, a niggling wrist injury has prevented Del Potro from returning to the form which resulted in his triumph at the 2009 US Open. After another round of surgery Del Potro is ready for a second comeback. The Argentine has again chosen Delray as he reincorporates himself on tour and is hoping to duplicate his past success. Del Potro will be joining a stacked field at the Delray Open that includes Milos Raonic, Kevin Anderson, Bernard Tomic, Ivo Karlovic and Grigor Dimitrov. The Delray Beach Open will take place February 12 – 21, 2016. 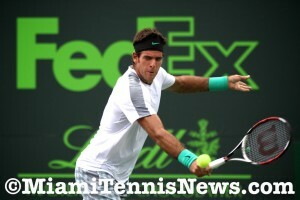 DELRAY BEACH: 2011 Delray Beach champion Juan Martin del Potro is taking a wild card into the Delray Beach Open, making his second appearance in the ATP World Tour event. 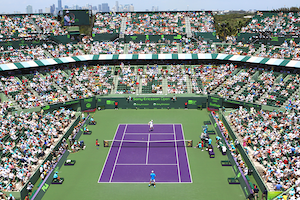 The 10-day event is coming up February 12 – 21, with ATP World Tour play scheduled to begin Monday, February 15 at the Delray Beach Stadium & Tennis Center. Del Potro will be making a long-awaited comeback from a bothersome wrist injury that has dogged the former world No. 4 and 2009 US Open champion for much of his career. In 2011, del Potro made his initial appearance in Delray Beach ranked No. 166 with just four tournaments under his belt following his first wrist surgery. He won the title without dropping a set, defeating Janko Tipsarevic for his then-8th career ATP World title. The 27-year-old Argentine has amassed 18 career ATP titles plus his Grand Slam US Open win, and has four Top 10 year-end finishes: 2008 (No. 9), 2009 (No 5), 2012 (No. 7) and 2013 (No. 5). He reached his career-high No 4 on January 11, 2010. Del Potro’s appearance in Delray Beach’s 32-player singles draw gives the tournament four former champions, including defending champion Ivo Karlovic, Kevin Anderson (2012) and Tommy Haas (2006). Additionally, the Bryan Brothers are defending doubles champions and will be chasing their third consecutive title. The 2016 Delray Beach field already features three Top 20 players including 2016 Australian Open semifinalist Milos Raonic (No. 11), Anderson (No. 14) and Bernard Tomic (No. 20). Karlovic (No. 24) and Grigor Dimitrov (No. 28) also figure into the strong draw. In addition to the ATP World Tour tournament, the first weekend of the Delray Beach Open includes an ATP Champions Tour event featuring six former stars playing in a Team USA vs Team International format. Tickets are available at yellowtennisball.com/tickets or can be secured from the on-site box office (30 NW 1st Avenue in Delray Beach) or over the phone (561-330-6000 ext.1). For more information: Go to YellowTennisBall.com.